Re-Stocked @ BOOKPEOPLE, Austin, Texas! 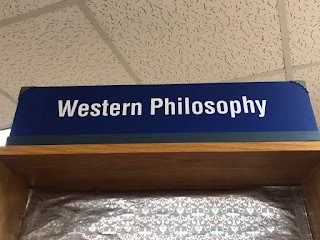 2nd floor Western Philosophy Section. George Vance McGee is now officially a PAID Income generating Indepedent Book Author! Get Excited! I am so happily excited friends, blog and books readers! Why? 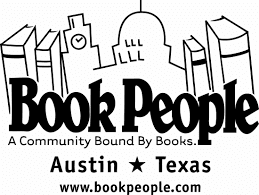 I just received an actual income CHECK from the largest independent Book Store in Texas, Book People. They've stated my $186.72 dollar book sale check is derived from in-store sales of 31 books. Alright! Thanks, patrons and readers for visiting BookPeople and buying my 2 books. According to BookPeople's consignment program, "Open Mindful, Philosophy on the Fly" has sold 16 copies, while "Attractive Tales from Grand Cities, a Social Memoir." has sold 15 copies. Excellent Book Author and Literary News All Around! Please continue to visit and buy my 2 books @ BookPeople in Downtown, Austin! The friendly, helpful and easy going Book Store workers, have re-stocked their shelves with my newly improved covers, page numbering, packaging, and Author Book Signatures. Both book versions are self-published via the LuLu.com book creation online system. Check out LuLu.com as well! 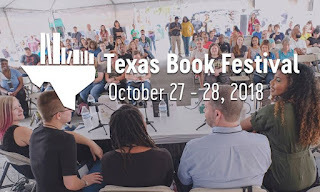 Texas Book Festival 2018. Bloomsday PODCAST Audio Gameshow Style Interview. Skip to 41:11 for GVM's Gameshow style interview. Click here for the DIRECT Podcast Link. "Open Mindful, Philosophy on the Fly" on the 2nd floor @ BookPeople. Walk up to the second floor, then find "Open Mindful" in the Western Philosophy book section. My 1st book is still there for sale, "Open Mindful, Philosophy on the Fly". click here to buy online, LuLu link. 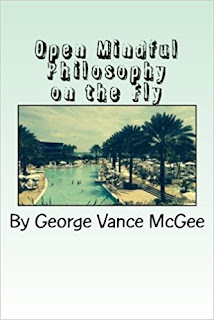 George Vance McGee Author of "Open Mindful, Philosophy on the Fly" & "Attractive Tales from Grand Cities, a Social Memoir." Darrell Bryant Author of "Geronimo's Bones"
Friday, June 15th, 7 pm. 2nd Floor @BOOKPEOPLE, Downtown, Austin, TX. Come in person to celebrate, and interactively engage with the 2 person AUTHOR panel: LIVE Book excerpt Readings. Talks, Creative Insight, Q & A. Self Published, Indie AUTHOR Advocacy!Progressive, Upbeat, Improvement Oriented thinking with FUN life stories sprinkled in!FREE, FREE, FREE to attend.June 15th, Friday 7 pm, 2nd floor, @ BOOKPEOPLE, Downtown Austin, TEXAS. seats and refreshments included! ANIMOTO, GVM BOOK AUTHOR promotional VIDEO! with Sound & Images. Click here to VIEW and WATCH. A Self published video from an INDIE BOOK AUTHOR. Click here to preview "Open Mindful, Philosophy on the Fly" For Sale. With new edits, page numbering, book covers and more. Earnest BOOK REVIEWS are welcomed. To write me personally, send to georgevance@gmail.com.